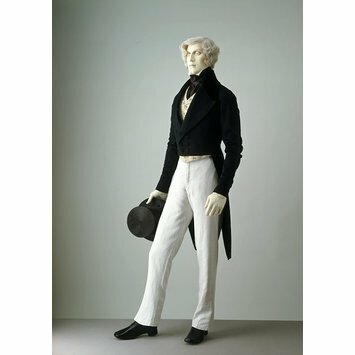 When trousers became fashionable in the first decade of the 19th century, they retained wide fall-front closure commonly used in the late 18th century. This began to narrow in the 1820s, and by the 1830s a fly-front closure, as seen in this example, became the most usual form. Buttons on the waistband allow the attachment of braces. Linen and cotton in pale colours were a popular choice for summer wear. 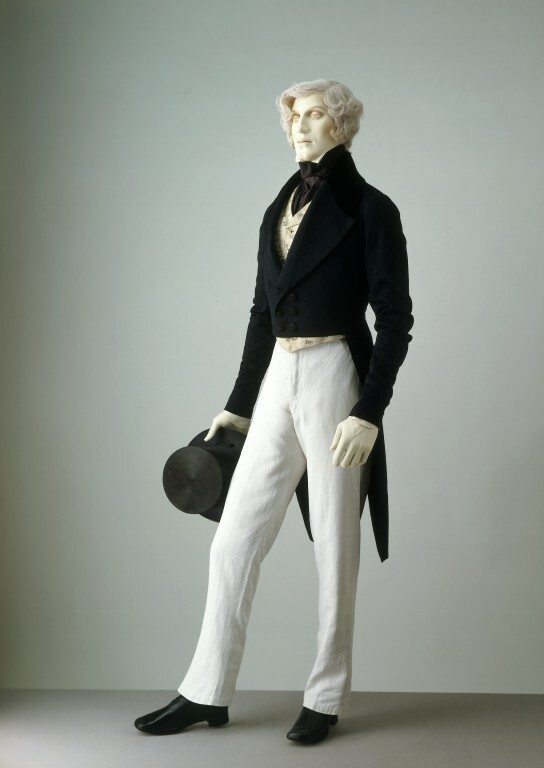 These trousers are reputed to have been worn by William Pierson Johnes, a linen merchant of New York City. Pair of men's white linen twill trousers. Full length and fairly narrow, tapering slightly and then flaring to fit over the foot. There is a concealed fly front. The waist band is narrow and shaped with four brace buttons and there is a buckle stay at the centre back to adjust the fit. On the right-hand side inside the waist band is a pocket for a watch, and written inside in ink with 'W. P. Johnes'. The buttons and two pronged buckles are of brass.